Recent studies have shown that Magnetic Resonance Imaging (MRI) parameters might be helpful to predict the clinical evolution of multiple sclerosis (MS), both in terms of natural history as well as in terms of response to therapy. Such parameters include the presence of new lesions as well as brain volume loss on follow-up MRI scans. However, in order to transfer these relevant research studies into the clinical practice there is the need of technologies and computerised tools, not currently available nowadays, capable of providing precise and robust measures for atrophy and MS lesion evolution in clinical day-to-day settings in a reproducible an efficient way. With the BiomarkEM.cat project (funded by "La Fundació La Marató de TV3", neurodegenerative disease call) we aim to develop, validate and implement in clinical practice fully automated and robust tools to measure new lesions and brain volume changes in patients with multiple sclerosis. The coordinated project, with a multidisciplinary team of computer science doctors, radiologists and neurologists with a strong background and experience within the field, will consist in the following essential blocks: data collection, development of tools for obtaining automated MRI-derived estimates and clinical validation. On the other hand, the NICOLE project (TIN2014-55710-R, Spanish RETOS 2014 call) aims to develop new automatic computer tools to extract robust MRI biomarkers . This will enable a new paradigm that will provide the basis for improving the diagnosis and monitoring of MS and stratification of patients by introducing objectivity and simplifying the daily clinical practice. 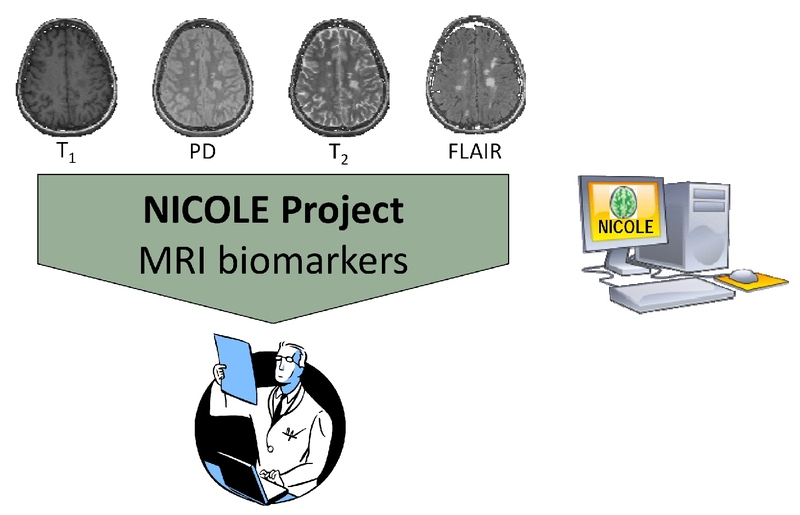 This NICOLE project aims to advance the state of the art in various areas such as the development of RM biomarkers for MS and the generalization of the tools for use in different MRI machines (Siemens, Philips and General Electric). The data acquired in the project will allow this pioneering work, analyzing the differences in performance with respect to MRI scanners and the development of strategies for obtaining more reliable, robust, efficient and fully automated computerized tools. These two projects are done in collaboration with Hospitals that are reference centers in Catalonia within the Multiple Sclerosis research field. IDIBGI, with Hospital Dr. Josep Trueta and Hospital Santa Caterina from Girona, and with Hospital Vall d'Hebron and Centre d'Esclerosi Multiple (Cemcat) from Barcelona. In the SALEM project we developed and validated an automatic system for the detection, segmentation and description of MS lesions based on computer vision techniques. In particular, we aimed to develop a computer aided tool in order to automatically detect and segment the MS lesions in MRI images, and to provide a quantitative description and a qualitative description for each patient. On the other hand, the AVALEM project aimed to automatically evaluate and quantify the atrophy of the patients and their evolution in time. These developed tools were tested and evaluated exhaustively in the Hospital centers involved in the projects: Hospital Dr. Josep Trueta, Clinica Girona and Hospital Vall d'Hebron from Barcelona . To introduce improvements in the diagnosis and monitoring of MS and stratification of patients by introducing objectivity and simplifying the daily clinical practice.